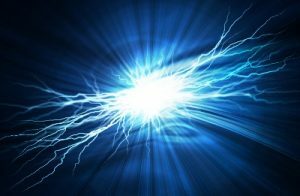 When a surge arises in case of lighting strike or a switching impulse, which could be the cause for insulation deterioration and at the end dielectric breakdown. This is a severe process, that depends on several factors, such as the frequency at which the transformer is exposed, the configuration of the system, the application of the component etc. Motors and distribution transformers are constantly exposed to fast surges, when they are switched by circuit breakers. Reigniting occurs during the switching of motors and transformers with vacuum circuit breakers, because of their ability to interrupt high-frequency currents. This article presents the analysis of the measured and calculated voltages along the high-voltage winding of the transformer. In order to calculate the voltage transients in the transformer windings, the most important thing to do is to determine the transformer parameters with highest accuracy. These parameters are the capacitances, the inductances, and the frequency-dependent losses. The modelling approach depends heavily on the type of the windings and the construction of the transformer. In this case, as test transformer we used a single-phase layer-type oil transformer. The primary winding of the transformer consists of layers with a certain number of turns, while the secondary winding is actually made of foil-type layers. Both windings are set on one leg of the transformer core. The transformer has special measuring points in the middle of the first layer and at the end of the first layer of the high-voltage side, and also at the end of the second layer of the same side. The measuring terminals are placed on the top of the transformer lid. The transformer windings are connected to the transformer terminals with conductors with different parameters, apart those used for the transformer windings. Through conductive insulators, the conductors are brought to the top of the transformer, and they pass close to the transformer core. The source voltage is not equal to the voltage measured at the first turn and the voltages measured on the selected points have wave shapes different from the source voltage shape. This test model is valid only for the high-voltage transformer winding and not for the other connections that connect the transformer winding with the measuring points. We can estimate the voltage at the first turn from picture 1, because the static voltage distribution is almost linear. On Picture 2a, comparison between the measured voltages and the calculated voltages at the end of the first and second layer that correspond to the 200th and 400th turn respectively is presented. Picture 2b depicts computed voltages at the line-end coils of specific layers. easily transferred to the transformer secondary side. These voltage values are higher when compared to the voltages that occur under the normal operating conditions. 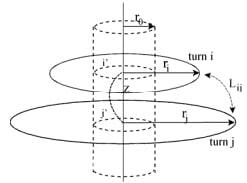 This is because the transformer secondary side voltage value, results from the inductive and the capacitive coupling that is between the primary and the secondary winding. During higher frequencies, the capacitive coupling has a dominant influence on the voltage amplitude and should always be taken into consideration. When we have a short-circuited transformer, the resonant frequency moves to the right and downwards. This brings up a conclusion that the core has great influence for frequencies below 20 kHz, while above 20 kHz the two characteristics overlap. For the purpose of this article, we have used test transformer with the parameters presented in table 2.
comparison between the actual and computed first-turn voltage at the high-voltage side when the measured current is used as excitation. The steepness of the calculated voltage corresponds to the value of the actual first-turn voltage. Picture 3b shows the measured and calculated voltage value at the secondary side. We can see that the calculated values of the model closely approximate the measured voltage value. The article is an analysis of the voltage distribution along the high-voltage winding of the transformer. 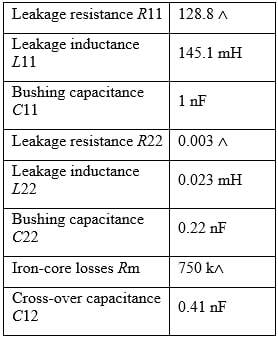 Also an analysis of the surge-transferred voltage to the low-voltage transformer winding is presented. Along the voltage measurements conducted in laboratory at the end of the first and the second layer, simulation has been made by applying the MTLM. We can conclude that there are no resonant frequencies in the high frequency region. Also, there is no internal resonance on the high voltage winding, however, for other transformers it might appear. This article presents the worst-case scenario. It is the case when a steep surge is applied directly to the transformer terminal. This scenario could occur in arc furnace systems, where the transformer is positioned close to the switching gear. When a cable is connected to the primary side of the transformer, the voltages will be less steep than in the case presented here. What do you think about this analysis involving transients and transformers? Please let us know in the comments area below. or copy this trackback: http://engineering.electrical-equipment.org/electrical-distribution/analysis-of-transients-layered-type-transformer-windings.html/trackback from your own site.